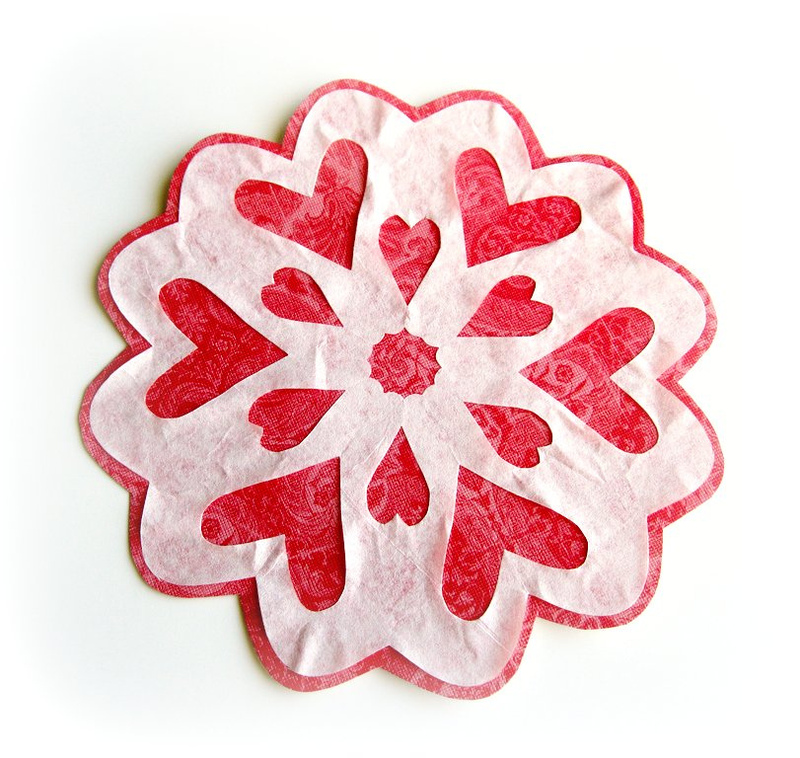 I've always wanted to make snowflakes out of coffee filters, so today I decided to make heart-cut VALENTINE SNOWFLAKES! 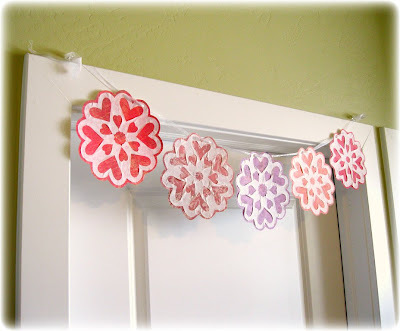 I love how they turned out and I want to share the tutorial with you. 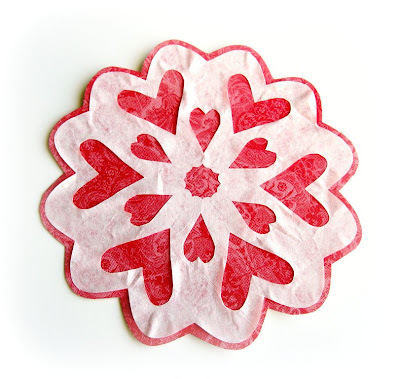 Coffee filters are the perfect medium for making snowflakes; they are perfectly sized, already cut round and thin enough to cut many layers at once. You can make these snowflakes faster than it will take you to read this post! I'm including a step-by-step photo tutorial on how to make these 6-point snowflakes (which in my opinion are MUCH cuter than the typical square snowflakes). This tutorial should be self-explanatory. Just enlarge the photos, if needed, for more details. Step #6 is to show you where to make the cuts. The blue-inked portions are the parts that will be cut off completely. The remaining white portions will be the snowflake. You are basically cutting two half-hearts and rounding off the point. Once you have finished step #10 (the end of the cutting), carefully unfold the snowflake and flatten it as much as possible. Then, glue your finished snowflake to some pretty patterned cardstock with a glue stick. It's best to start glueing from the center, out. That way, you can straighten and flatten as you go. 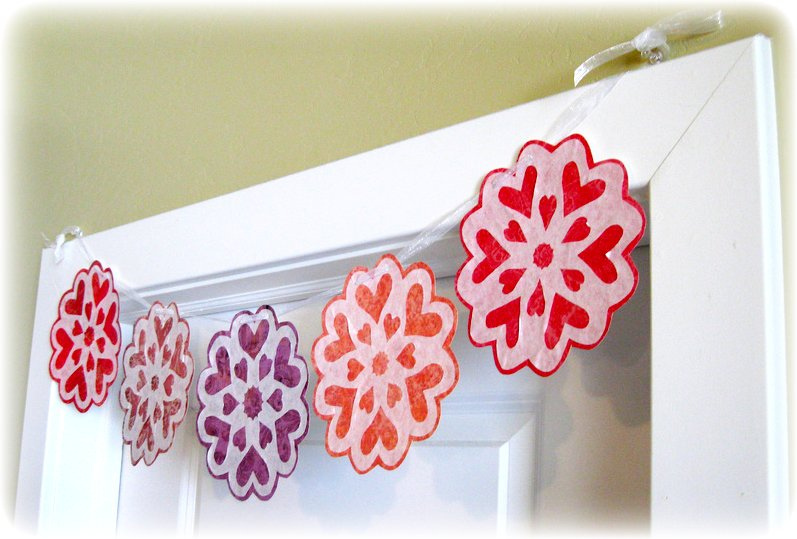 Next, punch two holes at the top of each snowflake and thread your ribbon through each one. 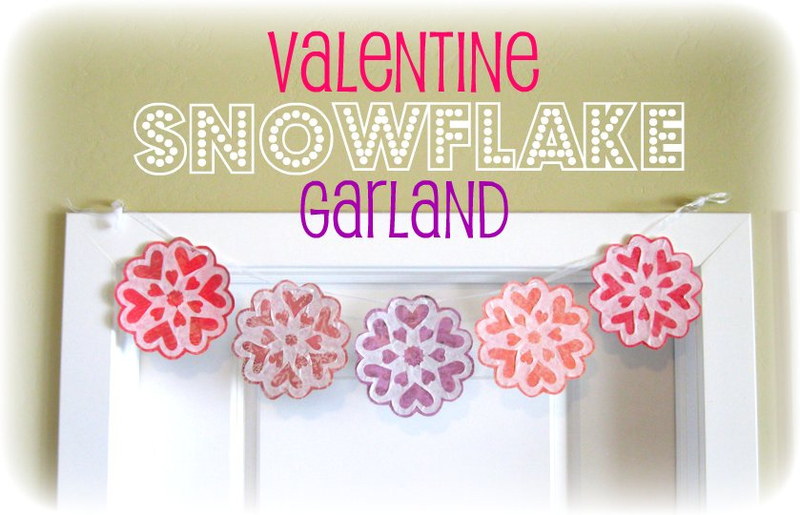 Space your strung snowflakes evenly along the ribbon and hang your finished garland anywhere you need some colorful Valentine love! Entry comments must be posted by midnight tonight! This is super cute, and would be great to make with kids! This is such a sweet idea! And thanks for the great tutorial. Liked it so much, we've just shared it on our Bellenza Facebook page! I love coffee filters for crafting and I love snowflakes (paper ones anyway) so this was a great project. It turned out so cute! This is so cute! I really want to make one now (as soon as I get my own crop-a-dile/eyelet setter)! 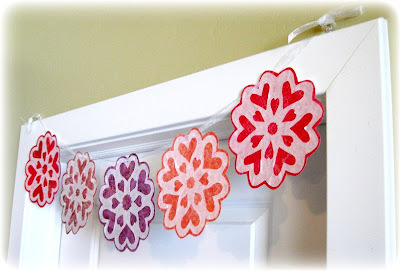 Saw it on House of Hepworths link party and had to comment! So cute! I'm featuring this on my blog today if you want to check it out. Thanks! LOving your blog ladies!!! Found you on Ucreate (such an honor, by the way, CONGRATS on that feature!). I would love to invite you over to my blog, Mine for the Making. I am currently looking for guest bloggers to share a tutorial or recipe with MFTM readers. If you are interested, please send me an email. I would LOVE to feature your blog! Nice to meet you girls! I'm Sandra from Brazil. Really nice Peppermint Plum! Glad to know your site! Your heart snowflakes are so cute! I love how you made them into a banner! How cute! My daughter would love a banner like that in her room! It's my first visit to your blog, I love your style, and the fact that you know the correct spelling and how to use the word voila! That.Is.Awesome. I'm going to try this soon. 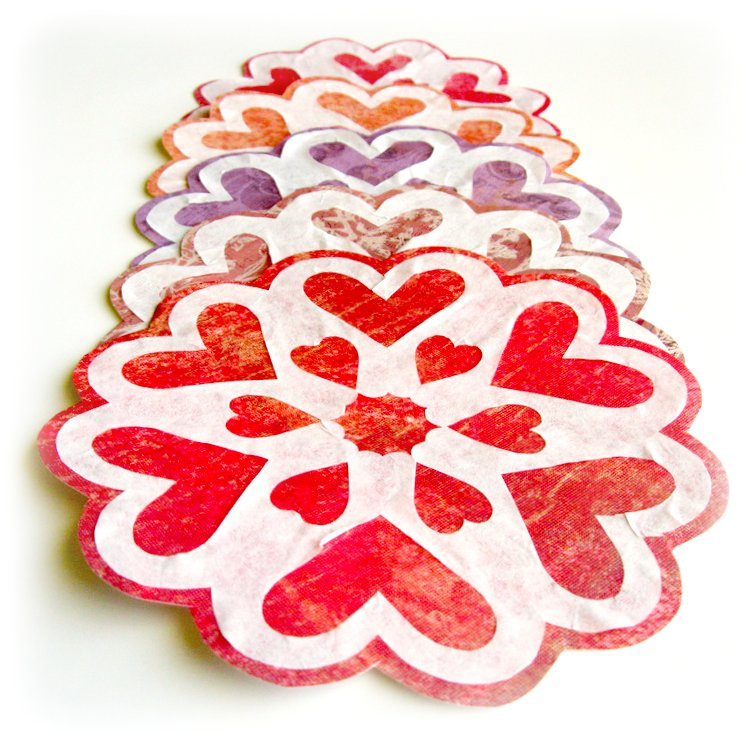 Very cute, and I have a million and one coffee filters on hand :) I'm a new follower from UCREATE. Love your blog. All of your creations are supper cute! I love your blog!!! What a fun idea! Thank you for sharing your creation with us! This is very cute! I'll be making some of my own for sure! Fabulous! I can't wait to make some of these lovelies with my daughter! Thanks for the tutorial! Loved making it myself. Super cute! I'm the worst snowflake maker ever...but I'll try again with your great tutorial! What a fantastic idea for the upcoming holiday and a very affordable craft for the kids to jump in and help with. 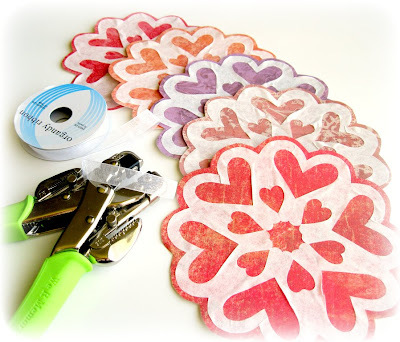 I have linked to your blog post at my own craft links blog below, thanks for the lovely idea. So cute! I am thinking about doing a Winter/Christmas theme for my son's birthday in Decemeber (I'm a planner :P), so I bookmarked this post. Off to peruse your other posts! Thank for inspiring me. I can't cut my way out of a paper bag, but will try this will my girls. What a great idea. And so cute too. though I live in a hot country, I love these. I just used your idea in my classroom recently. I asked my students to make three of these and we glued them to papers in shades of blue. On the back of each paper, I asked them to write a poem about snow and/or winter using 3 of the various types of poetry we've studied so far this year. I connected them with string and they are hanging from the classroom ceiling twirling gently above us like a mobile. So cute!